I actually wouldn't be able to do it myself. Watch this video of the La Scala Orchestra playing Mahler 3rd, and see how unusual the flutist's hand position becomes when he rolls his flute backward rather than line up his headjoint more inward to the key centers. The big flute-piccolo feature is at minute: 2 min. 10 seconds. And feel free to comment. I've rarely seen such a good example of backward tilting key tops. Now compare the above video of the La Scala Principal player's key-top angle to that of Pahud and Baker in these photos below. Notice how Baker, Pahud, and most professional flutists key tops are parallel to the ceiling. I've always thought that was the only way that really worked to balance the heaviness of the rods, and stop the flute from rolling inward while you play. Interesting and, for a professional player, quite rare. Normally, if a student flutist were playing like this, I'd simply have them gradually start to turn their headjoint in more and get used to having the key tops parallel to the ceiling, so that the hands and fingers could work a great deal less hard holding the flute level. I sure would love to speak to this Principal at La Scala and find out whether he has problems controlling pitch on thumb-free notes like C natural and C sharp. All I can say is that that is rather strange, and if I did that, my hand would be completely useless by the end of an hour!!! I thought the flutist in the La Scala orchestra was generally playing flat as a result of his turning in so much. I'm not sure it is so much of a balance issue, however. He may have have some kind of thumb rest or been pushing very hard with his LH index finger to keep the flute stable. I have a very heavy gold flute with C# trill and split E, so I find that I have to roll the flute keys very much forward to get it to balance in the hands. This also means turning the headjoint in toward me a bit in the Rockstro position, even though I use a cork "roll bar" or "Thumbalina" which keeps the flute keys from rolling in toward me. I use the headjoint alignment described at www.jennifercluff.com/lineup.htm. This is the one where the center of the flute's middle joint keys line up with FAR edge of the blow hole, plus a thumbalina (Thumbport), and have the keys slightly tilting forward, but basically parallel to the ceiling. I have a lightweight flute (no gold, no C# trill) with a split E, and a flat chin. I find that chin-depth makes a difference to headjoint alignment, as does hand size and finger length. But the number one reason why I developed hand and arm pain was from inline G on an open-hole flute, and setting the headjoint line-up to the center-of-blow-hole lined up with center-of-keys. So I've become hyper aware of this Keys Tilting Backward issue. I am seeing more and more players do bizarre things with their hands and with the line-up of their flutes. Another problem is that many players use head-joints of gold and platinum (heavier alloys) on silver bodies, thus causing more weight for the left hand and creating an imbalance. Really? Are you seeing an increase in bizarre hand-face ratios in flute players? Or has youtube just allowed us to see dozens more "flute recitals" than we ever could in one geographical locale? J. Yes, I am...I am not sure what the deal is. I play on old Haynes and Powell flutes (both plateau and French) and they work for me. Seems like I can keep a better hand position with those flutes. (Because I grew up on them perhaps???) But low and behold, my hand issues didn't start until I started playing modern Japanese flutes. Several flute makers have told me that the new dimensions of modern flutes, particularly Japanese, including differing key heights, etc. have caused instruments to speak more quickly but are not very ergonomic. Jack Moore once told me he believes there is a parallel between changes in flute dimensions and the increase in extensions and "stick-on" devices players are using today. All I can say is that I am much more comfortable physically on an old Powell or Haynes than on any modern flute I have found. I would never suggest that all players should do as I do, but there is a staggering number of players leaving the profession due to hand problems. By the way, you are a GREAT communicator. If you don't have your own flute boot camp you need to start one!!! You know I'm very interested in what Jack Moore said about modern instruments being less balanced in the hands. I've only ever played on Japanese instruments and I've got all sorts of extensions and thumbports stuck to my flutes. Could you be our "field agent" and go and get an interview on record with Moore or other flute maker? That would be incredibly helpful. Thanks for your input. As a former member of the flute industry in the States (I am now pursuing Psychology as my day career), I have had a beer, coffee, or tea with almost every major flute-maker of our time. I can tell you numerous things that have been said, some in private, some on the record. I will say that almost every flute maker has told me that the ideal flute (ergonomically and acoustically) would be made with closed hole keys, offset, and B-foot. However, it is the market that drives flute manufacture, not the opinions of the people who build them. 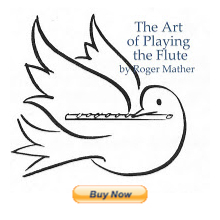 Much of what is available is driven by what famous flute players tell everyone to go out and buy! I am saddened by the arrogance of players who are NOT at all interested in the advice or opinions of the poor souls who labor in building our instruments. More American flutists would do well to seek their wisdom. James Galway's enthusiasm for creating relationships with makers like Nagahara and Lafin is something all flutists should do. It should be a symbiotic relationship. I am also shocked by the debate over scale designs, etc. Kincaid, Baker, Nyfenger, Gilbert all played traditional scale flutes long before Albert Cooper's design become universal. I often hear people complain about the "out-of-tune" old Haynes and Powell flutes, but it is just as easy to play a modern flute grossly out of tune as well. And why do so many of America's principal flutists play on older Powells if they are so terrible?? Agree totally, except for "old scale" vs. "new scale". That's still up for debate. Love to hear more bonefind input about flute builders and ergonomics. I play a closed hole (plugged), offset G, B-foot, and it seems to be working out. Jen, you need to get on facebook. I already spend *enough* time yakking by typing. This is a very interesting topic to discuss. I recently attended a program in which the lecturer discussed and suggested that we all play with our keys having a slight forward slant. Since then I have been playing with this idea and have come to the conclusion that having a slight slant or a more balanced hand position depends more on the preference of the individual and actually can actually differ practice to practice. I'm not sure if this is an acceptable finding but this is what I have observed in my own personal practice. Regarding the flute's keys slanting forward, that actually works very well for long fingered flutists. Alexa Still pointed out once that she actually keeps her flute rolled out to the best position for her large hands, by letting the edge of the left thumb key rest at an angle on the shank of her thumb. (like a thumbport for the left hand in this case.) This allows the control to stop the flute from rolling inward, OR it allows the keys to be tilted forward if that is more comfortable. There are articles on this based on the comparison between Boehm and Rockstro flute design in this regard. On the contrary, Rockstro suggested the flute should tilt forward so the rods on on the very top in the overall ratio of the flute. Now, players tilt back for two major reasons; preference due to the length of the thumb and when flute is tilted toward the player him/herself, it forces the fingers to curl more, allowing less unnecessary horizontal movement, more leverage and increased dexterity/speed. In regard flute tilting forward for long finger players, it doesn't work that way because the finger can only reach out comfortably, as far as player's thumb allows. I'm not sure if I agree with the physics of what you describe. I tilt the keys very slightly forward to avoid the weight of the rods from rolling the flute inward. I have very long fingers and thumb, and my fingers are curved. Surely it's possible to reposition the thumb to enable the best hand position for the length of the fingers. For flute to balance itself unassisted; with only the resting point in place, using the main rod at a reference, it will need to be at approximately 25-30 degrees before it falls either direction. For the flutist with La Scala, I wonder if it was the angle of the camera that gave the illusion of him playing titled inward like that. Rockstro advocated this and is not achievable if the right thumb is push against/parallel with the F# kicker. At this angle, this position brings the keys closer to the left hand fingers but at the cost of slight bending of the left wrist and raising the wrist upward so the fingers have to go over the rods to reach the keys. I hope you don't mind but as I researched, images of you holding flute popped up and I noticed for the length of your picky,you're almost hitting the D# post when your pinky is at rest it is almost point at the post and inline with the narrowest part of the D# lever. Also, may I ask why you are using the thumb saddle if you have a long thumb? The reason why I ask is if you pull back the thumb further behind the flute with a saddle, your fingers will need to compensate by going further past the keys. I see your fingers are relatively horizontal, when I say curled, I am talking about all first joint of the right hand fingers are about 20 degrees contact with the key rings. I agree with you on repositioning of the thumb and its role is important as it affects the way one's hand position is formed to allow better leverage for our fingers over the keys. I don't know if this can be discussed in words with degrees given etc. I think it depends on comfort, accuracy and speed. I have a damaged left arm, extensions added to my flute, and a partial-rockstro position. It's what works for me; I have speed, accuracy and comfort, and given my ergonomics that is working for me. If you want to send photos or videos of your ideas, go ahead.